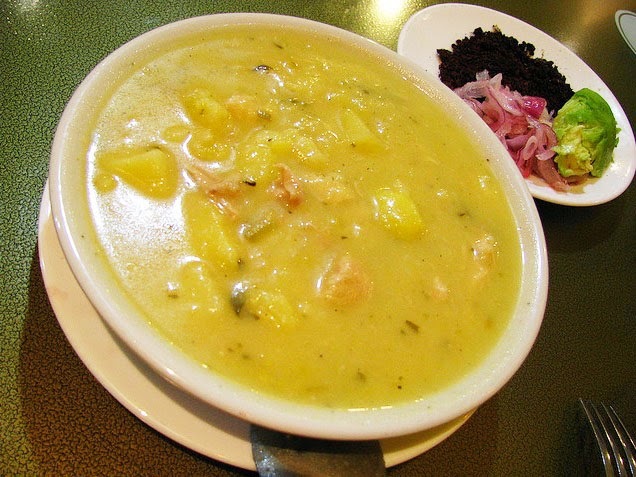 This is one of the most important dishes of Andean food. The cuy grow up in family farms and are minutely elaborated with special seasoning. 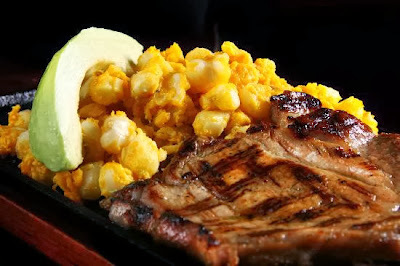 It takes about 60 minutes to grill, cuy serves with potatoes, salad, corn, and avocado. Cow foot soup is a typical Ecuadorian dish, it's made with cow feet, yuca, corn (mote), peanuts, milk, onions, garlic, herbs and species. It's a good soup for hangovers and it takes to cook for about 4 hours in fire wood. Tripa Mishqui is very popular in Ecuador Highlands, it's pork or lamb intestine, which is roasted and cut in small pieces, this dish is served with mote (corn), potatoes tomato, onion, avocado and herbs. They are likely to be seen in La Floresta (Quito). 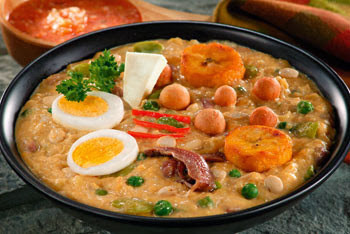 Fanesca is a traditional soup served in April during the Holy Week, this dish has 12 different kinds of beans and grains, it also has bacalao (salt cod), sambo and pumpkin (zapallo). The last finishing touches are boiled eggs, maduro (banana) and herbs. 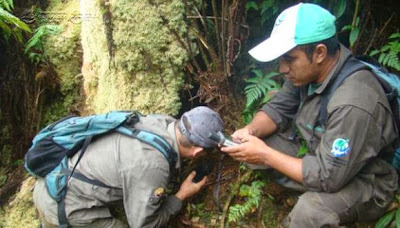 Chontacuro is a typical worm of Ecuador's Amazon region, especially in the province of Napo. It comes from palms called "chontaduro". 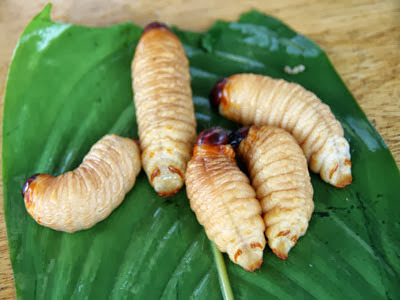 This worm can be served fried or grilled, natives consider the delicacy as a good source of protein and fat animal. 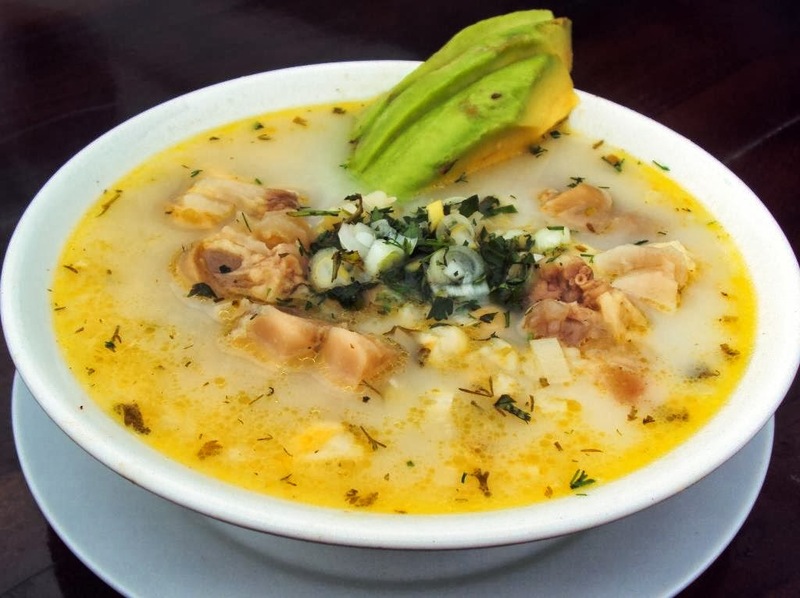 Yahuarlocro is a light stew prepared with meat and lamb including intestines, liver, lung, tongue, etc. It's usually served with fried lamb blood, avocado and species. It can be the main dish depending on the size of the plate. 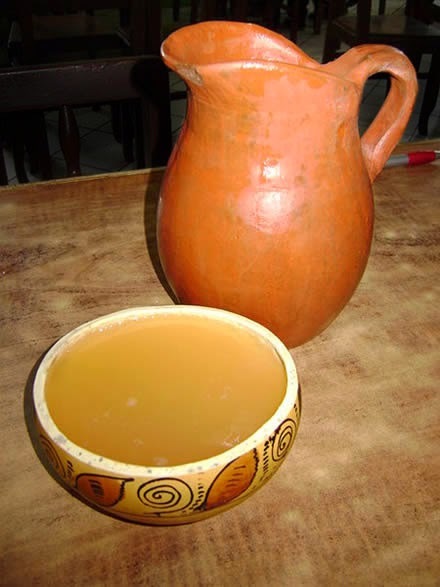 Chica de Jora is a corn beer prepared by germinating maize, extracting malt sugars and fermenting in large vessel. The inca used chicha for ritual purposes and consumed during festivities. 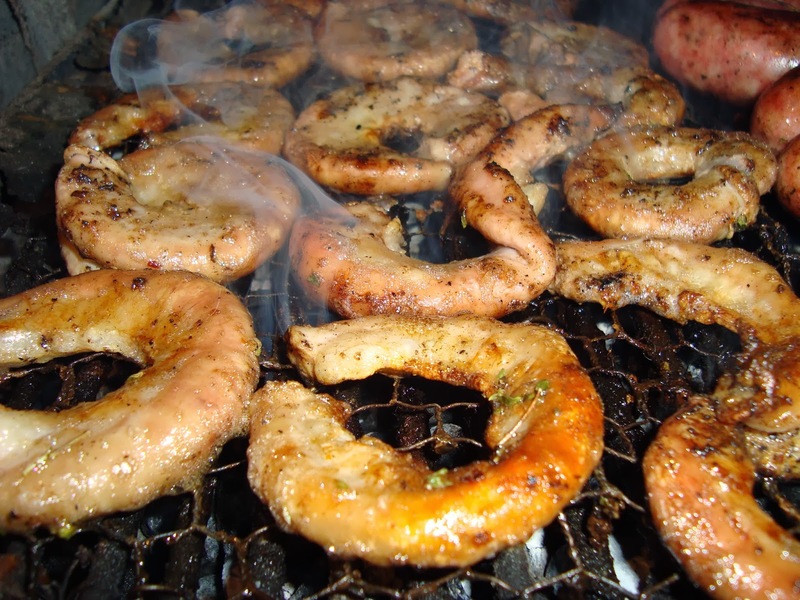 This traditional foods you'll see in Ecuador, would you try these dishes? 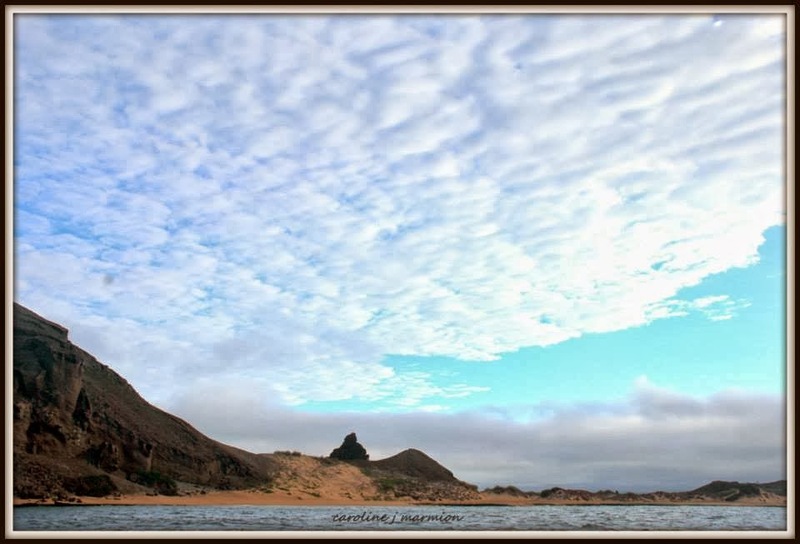 What is the best time to visit Galapagos? 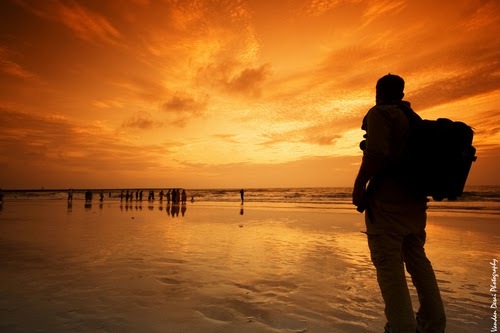 You can visit Galapagos Islands at any time. The islands are isolated, so the Galapagos climate is, determined almost entirely by the ocean currents, which in turn are influenced by the trade winds which push the currents. The Galapagos is a major intersection of several currents, which vary in intensity during the year as their driving trade winds blow and then weaken in a cycle that gives two distinct seasons to the islands. These currents also control the pattern and variety of Galapagos plant and animal life. The Galapagos climate is unusually dry for the tropics. There are two main seasons, each of which has a dramatic effect on the vegetation. From January to June, air temperatures are warm and the skies are usually clear with occasional heavy rain showers. From June to December, the air is cooler from 24 to 16°C, the skies are often lightly overcast or cloudy, and there is virtually no precipitation in the lowlands, while the highlands are almost continually wet with light rain "showers" called "garua". The January to June season is known as the warm/wet season and the July to December as the garua or cool/dry season. During the garua season, prevailing winds are from the southeast and the sea is often choppy, while during the warm/wet season winds from the east prevail, and the sea is gentler. Between seasons, the weather is highly variable and unpredictable. This inter seasonal period may last as much as a couple of months and the dates may vary from year to year. The climate in different parts of the archipelago is also varied. Sea temperature in the islands ranges from as low as 16°C to as high as 28°C, depending on season and site. The Galapagos weather are distant from any other land mass, and consequently their climate is largely determined by the ocean currents which bathe the archipelago. During the garua season, cooler waters from the Humboldt (Peru) Current are dominant with average sea temperatures of 22°C in Academy Bay. As a result, air temperatures are cool and an inversion layer is created. The moisture evaporating from the sea is concentrated in this inversion layer (300 to 600 m above sea level) and only the higher parts of islands, which intercept this layer, receive rain. The lowland areas remain dry, though cool. The variation in rainfall with altitude is a result of this inversion layer and has important consequences for the zonation of vegetation. Not only do higher parts of the islands receive more rain but this rain is concentrated on the southern and eastern slopes. The northern slopes of islands, and islands in the rain shadow of other islands, remain much drier. During the warm season, the southeast trade winds, which drive the cool currents, diminish in strength and warmer waters from the Panama Basin flow through the islands. The average sea temperature in Academy Bay rises to 25°C. The warmer waters cause the cool season inversion layer to breakup and normal convective cloud-forming occurs. The islands experience a more typical tropical climate with blue skies and occasional heavy rain showers. In some years, the flow of warm waters is much greater than normal, and an "El Niño" year results. Surface water temperatures are higher and rainfall can increase greatly. Life on land burgeons but seabirds, which depend on the productive cooler waters, may experience dramatic breeding failures. 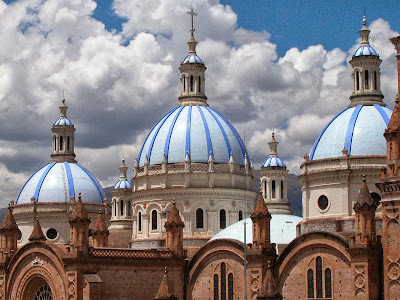 Cuenca, was chosen for the full of culture, architecture, and friendly people as candidate for the "New 7 Wonders Cities." 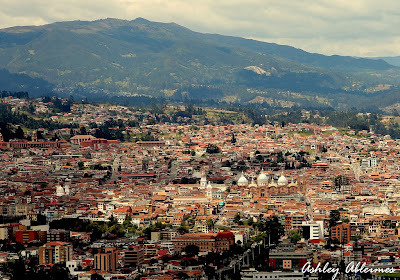 Cuenca is one of the 303 that passed the first phase for the New 7 wonders cities. On December 7th the New 7 wonders will choose among the 77 cities voted to the 28 finalists. While parents and kids often do separate activities on a family vacation, more than half children agree strongly that vacations are a time when they get to sped quality time with their parents. Set aside time to make memories together on your family vacation and you'll have stories to tell for years to come. 2. Consider including your children's grandparents. Children are enthusiastic about travelling with their grandparents. Well over half of children reported feeling closer to their grandparents after a family vacation together and enjoying remembering what they did with their grandparents after they returned home. When asked to identify their favorite memory from their last family vacation, more children selected "what they did" than any other category. For kids a meaningful vacation is one where they get to do interesting things and this is more important than where they say or where they go. More than two - thirds of the children surveyed believe that a family vacation is an opportunity to try activities that they cannot do at home. A family - friendly adventure will broaden your children's horizons, brig all of your closer together and create lasting memories. 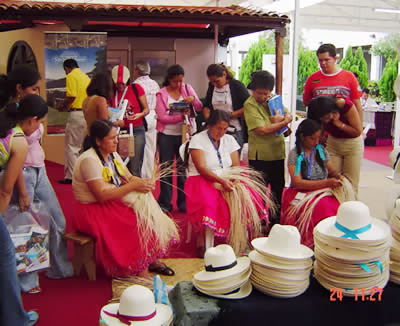 In the last 7 years, Ecuador became very popular in the living world's International ranking. 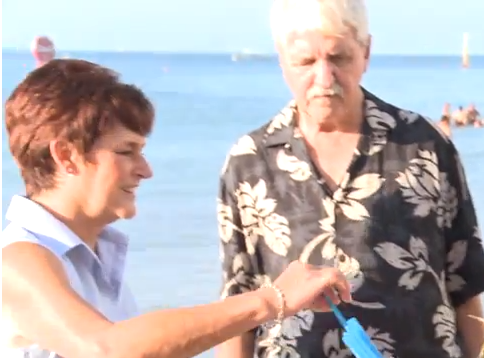 Nowadays is the best place to retire according to International Living magazine. 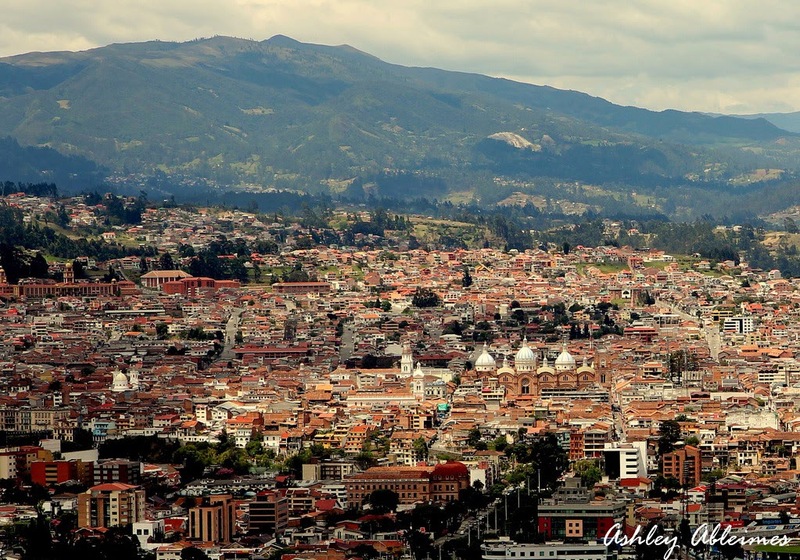 Why is Ecuador a good place to live? great weather, cheap cost of living, variety of food, landscapes and excellent medical care, are some of the reason to live there. 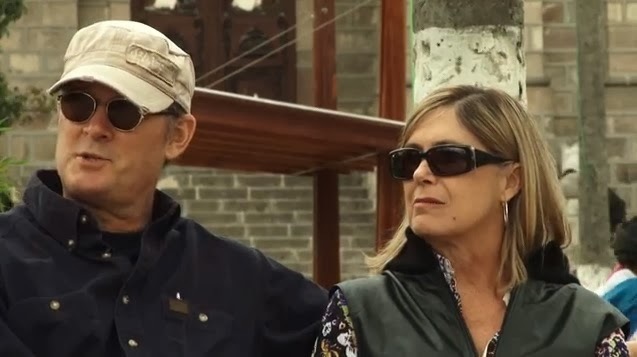 "We were in Ecuador for one year in 2001 and we traveled all over the country. 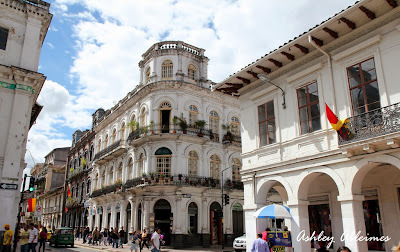 For such a small country it's amazingly diverse ,because of the mountains, you can have beaches, anything you want, just fell in love with Ecuador"
"We came to Salinas,we walked in this house on our trip,and we walked up saying how lucky we are to live on the beach, in a beautiful home, everyday! I mean we are very very fortunate to be here. We have many benefits, medical care has been excellent, tickets to concerts, bus transportation..."
"We came here about a year, we came here because it's an affordable place to retire, my husband was 55. His pention wasnt that grade for the United States. We decided to live comfortably and we found Cuenca affordable. 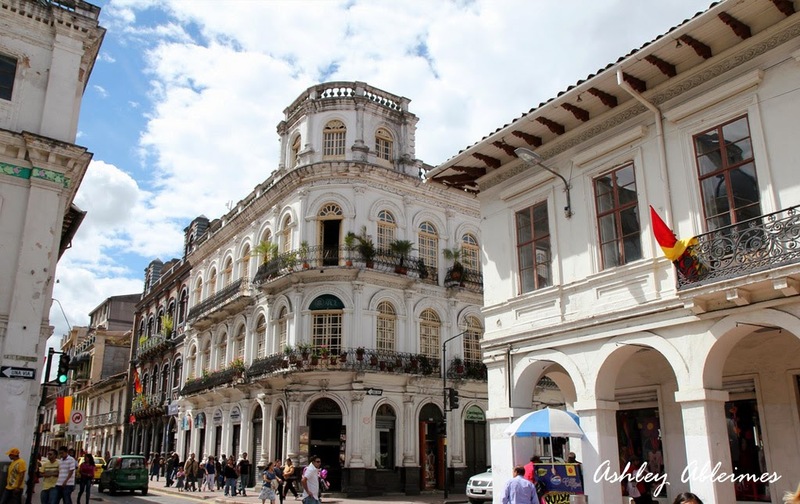 Ecuadorians are very kind, very gentle people, they care about each others..."
"See why Ecuador is the best destination for retire"
What should I bring to Galapagos Islands? Aloe Vera cream or gel for sunburn. Just in case. Waterproof bag for your camera or a plastic bag to keep things from getting wet. Camera. If you have an underwater camera would be better. Galpagos Islands use 110V electricity. Credit card. There are ATM's on San Cristobal and Santa Cruz Islands only. Debit cards. Use is limited in Galapagos, on the mainland is ok.
USA Cash. It’s better, if you can bring small bills. Bills of no more that 50.00 USD for your extra personal expenses and tips. I suggest you to bring casual clothes that are light weight, comfortable to wear and walk. Please consider that the flights to Galapagos limit you to a maximum of 20kg. Comfortable walking shoes (2 pairs). Sturdy sandals with straps, not flip-flops, a wind breaker or rain jacket, lightweight rain suit or poncho and a light wool sweater for cool evenings. T-shirts, lightweight pants and short pants, light cotton socks, 2 or more swim suits, light short sleeve shirts. One extra towel for the beach. 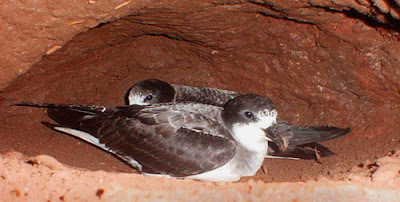 As well known Petrel has critically endangered on The Red List of Threatened Species, but a census made during the last months by the Galapagos National Park determined that 70% of nesting petrels are active, the monitoring is being developed in the San Cristobal Island. Petrels are predated by introduced animals such as rodents or feral cats. The monitoring equipment check if there are alive nests according to the presence of adults, chicks, eggs or traces of feathers. In order to increase the number of protected areas and species, forest keepers list the nest position with the help of global positioning devices (GPS), it's important to verify the good conservation of the nests. 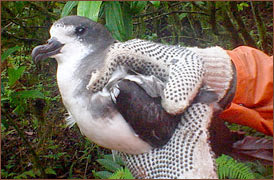 The biggest collapse of the Galapagos petrel population occurred on Santiago Island, where it fell from about 11,250 pairs to fewer than 500 pairs in two or three decades. An Albino Darwin's Finch was seen in Galapagos. An Albino Darwin's Finch was seen in Galapagos Islands on the border of the Sierra Negra Volcano on Isabela Island. The Excursionists were very excited about this sighting that happened while doing the excurcion the volcano Sierra Negra organized by Nature Galapagos & Ecuador. "Albino animals are extremely rare and unusual. They have all the characteristics of others of their species except they are all white in color. Not one inch of their natural coloring comes through as their bodies are unable to produce a pigment known as melanin. Melanin creates the normal pigmentation and coloring in an animal’s skin, fur or scales. This lack of melanin generally results in the animal looking bleached all over, appearing white or pink. Being white doesn’t mean an animal is albino. The true test is in the eye coloration. All albino animals have pink/red eyes whereas white animals with blue eyes are called leucistic, which means they may have a reduced amount of pigmentation in relation to a normal specimen of their species but it is not as severe as albinism. We have some of both pictured here. The Galapagos Islands are located in the Eastern Pacific Ocean, 973 km (604 miles) off the west coast of South America. The closest land mass is the mainland of Ecuador to the east (the country to which they belong and should leave to get to the Galapagos Islands), to the North is Cocos Island 720 km (447 miles) and to the South is Easter Island and San Felix Island at 3200 km (1,990 miles). The Galapagos Islands consist of six main islands: San Cristobal, Santa Cruz, Isabela, Floreana, Santiago and Fernandina these last two uninhabited, 12 smaller islands and the island Baltra uninhabited Santa Fe, Pinzón, Española, Rabida, Daphne, Seymour, Genovesa, Marchena, Pinta, Darwin and Wolf and over 40 islet. The islands have a population of 28,000 with exception of people who are temporarily working or visiting the islands.